Here is the Festival Poster, as jpg and pdf. 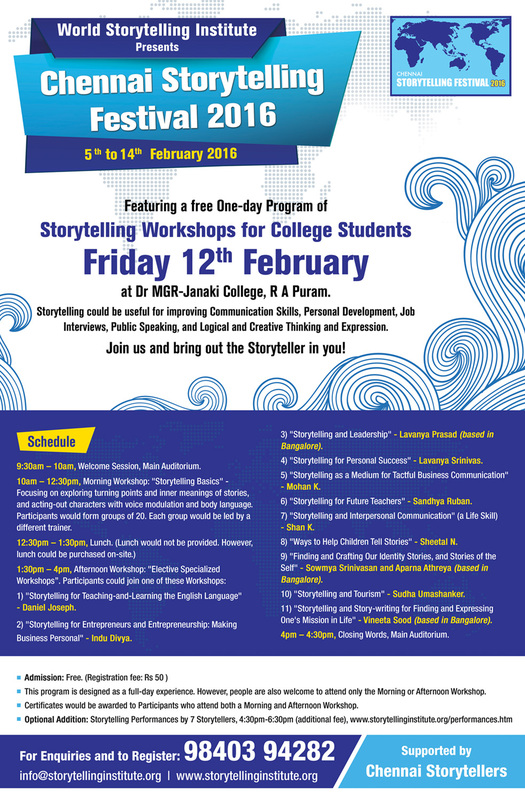 * A day of free Storytelling Workshops for College Students, on Fri 12 Feb. Info is here. 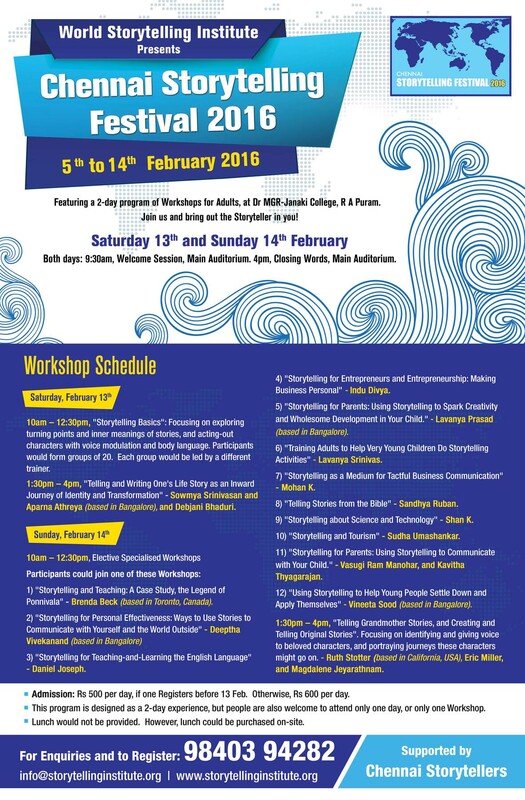 * 2 days of Storytelling Workshops for Adults, on Sat 13 and Sun 14 Feb. Info is here. * 5 evenings of Storytelling Performances! 7 Storytellers each evening! Info is here. 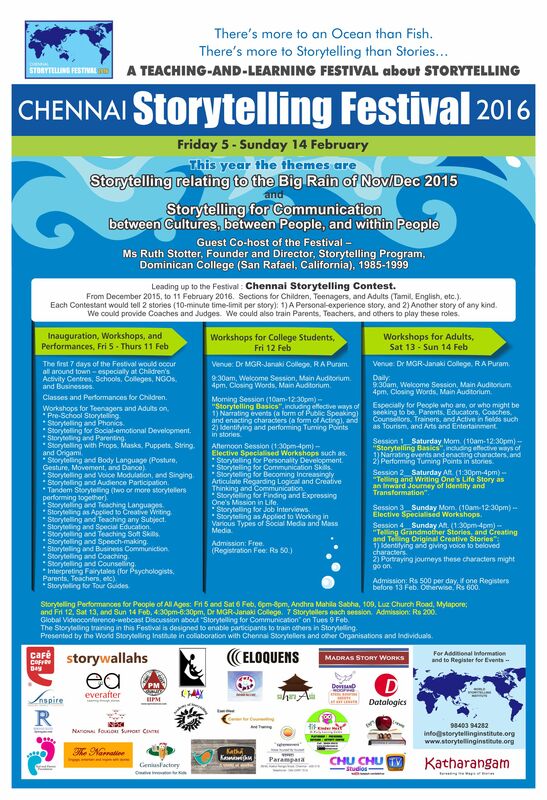 * Please click here for info about -- and a link to a recording of -- the Festival's videoconference discussion about "Ways Storytelling can be a form of Communication, and the Storytelling Revival today" (Tues 9 Feb). * Media coverage of CSF 2016. 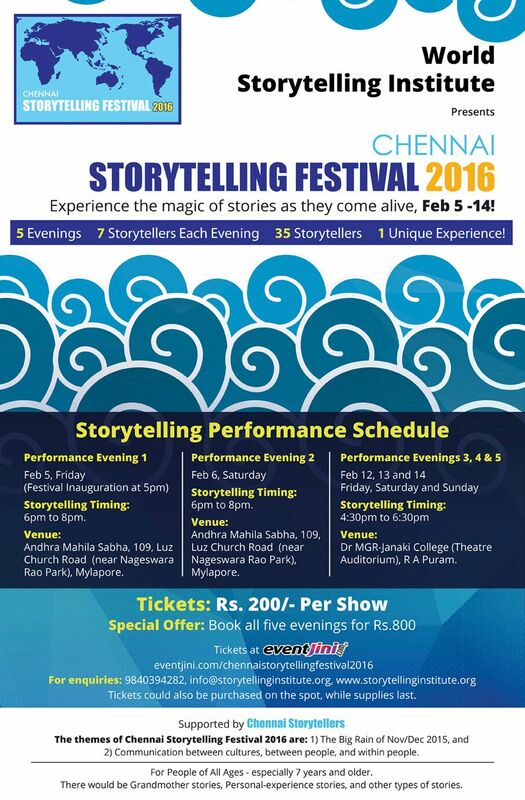 CSF 2016 is the 4th annual Chennai Storytelling Festival. The Festival Guest Co-host this year is Ms Ruth Stotter. Storytelling for Communication -- between Cultures, between People, and within People. Including topics such as: Travel. Tourism. Translation. "Journey" and "Path" as metaphors for life. Visiting other lands and worlds. Discovery and Exploration of the other, and of the self. The Big Rain of Nov/Dec 2015. Info about recommended hotels -- with the possibility of sharing rooms -- is here. Documentation of the first 3 editions of the Festival -- CSF 2013, 2014, and 2015 -- is here.